Joe Barza has over 25 years of experience as chef and has helped raise the profile of Middle Eastern cuisine and chefs. He is known as the rebel chef who revived Lebanese cuisine by combining local ingredients in unconventional ways in order to create new trend setting revolutionary dishes that have become his trademarks. Chef Barza has earned award in international culinary forums where he has represented his country with pride and honor. 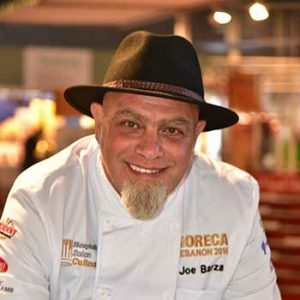 In addition to being Founder and Chef Consultant of Joe Barza Culinary Consultancy, he is a member of the Academie Culinaire de France, The President of the Lebanese Chefs Association and is seated on the organizing committee of the Lebanese Salon Culinaire HORECA. He is the consultant of GET GROUP in Qatar, Waldorf Astoria in Ras Al Khaimah, Hilton in Jordan, as well as many more. Chef Barza has participated and hosted a number of TV shows and programs. He has taken part in many international events around the word representing Lebanese cuisine.